Travel days are exhausting, and can at times, be painfully miserable and long. This goes without saying for a backpacker with a do-it-yourself type of mentally. I desire the freedom and options to choose where I go and what I do. But sometimes opting to do things myself, rather than through a tour or group, can lead to heavy punishment in the end. We flew into Yogyakarta, Indonesia where we continued on through Java, eventually ending in Bali via Mt. Bromo. Getting from Yogyakarta to Mt. Bromo was pretty straight forward. We decided on taking the quickest, cheapest route, which entailed a four-hour train, a two-hour bus, and finally, a one-hour minibus. 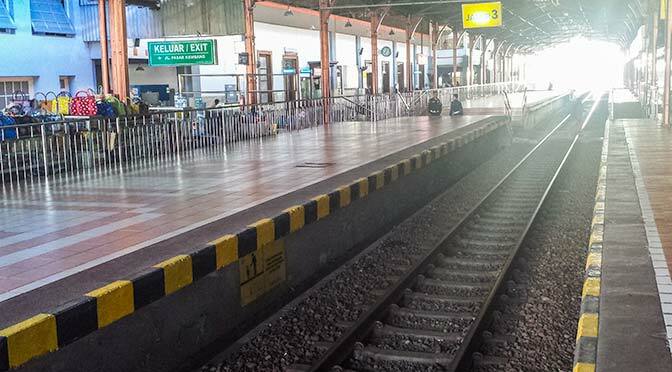 We took the train from Yogyakarta to the Surabaya Gubeng station. Upon arrival at the train station, we were bombarded with touts promising “good deals” and “cheap rides”, but still quoting high prices. We had to ignore the hordes, and literally walk outside of the train station to a nearby busy street. Here we were able to find the metered, reputable, “Blue Bird” taxis to take us to the Purabaya bus terminal. It was over a thirty-minute taxi ride to the bus station. We walked through the station to the back where the buses are located, found the Probolinggo bus, checked fares, and boarded. While we waited for the bus to continue to fill, we watched curiously as numerous concessioners walked through, handing out random snacks and trinkets to passengers, as well as laying them down on seats. We have learned to watch other people handle these new-to-us situations. It is kind of tricky, as we would have assumed these items came free with the bus ticket. But minutes later, the concessioners returned and collected the items, or money, if taken. It did not take long to get used to this, as well as the singers, guitar players, and dancers entertaining us as they walked the bus aisles trying to collect money. This occurred throughout our trip at almost every bus stop. One or two stops before the Probolinggo bus terminal, a man got on and said that this was the stop to connect to get to Mt. Bromo. He focused on the few white passengers and started collecting their bags. We were skeptical since this didn’t seem like the bus terminal, but after delaying and asking him more questions, he got the others off quickly and left. It was all slowly coming together since we had read about this potential scam. The scheme includes the bus stopping at a tour agency before the terminal, lying to get enough white tourists off the bus to fill their minibus, charging them whatever they please, and continuing on to Mt. Bromo. I guess it is good to be a little skeptical? Once we made it to the proper Probolinggo bus terminal, we met a nice young Indonesian man who was also heading to Cemoro Lawang, the town next to Mt. Bromo. The touts came to start haggling with us, but our new friend said enough for them to leave us alone. We continued out of the bus terminal and around the corner to where all the minibuses were located. There were two couples already there, that had been waiting for a few hours for more people to fill a minibus. Once we arrived, we only had to wait another thirty minutes before one more couple came to make the minibus technically full. The driver sneakily went around to everyone saying that bus was not to the “full” capacity, but if we each would pay more, then we could leave now. I was not happy, because it was already more money than I wanted to pay before he tried to increase the fare. He got everyone on the bus, and was threatening to make us wait for the next bus, which could be hours. We said we would wait, and our new friend negotiated for the three of us to pay the previously quoted price. Without his help, I am not sure how long we would have waited or how much we would have had to pay. On the bus ride up, we found out what he had most people pay, including one couple that paid over double the fare we did. The driver made out really well for himself, somehow convincing everyone to pay these amounts. To make this situation seem even more sketch, we were asked not to tell the others how much we ended up paying. Getting to Mt. Bromo took some effort, but was well worth it. Our first day there, we walked the 3 km across the sea salt planes to look inside Mt. Bromo — the active, steaming volcano. We met other travelers along the way, and the next day at 3am started hiking to the sunrise viewpoint together. It was unbelievable (worthy of a separate blog post at some point). We made it down the mountain that morning in time to find a minibus leaving that had a few spots available. We checked the price, and were relieved to be quoted the normal fare. After grabbing our bags and making it back to the same bus, we were quoted another fare almost double! so frustrating…but such is travel especially when you are the only white people and stand out more than a little. praise God for the little miracles along the way. Lesson learned for the future though!! Praying for you guys 🙂 love you!